“A pint of non-descript please” – How specific is the term ‘beer’? As is often the case I was recently reading the BBC Food website looking for a recipe when something caught my eye, it wasn’t what I was looking for but it had the words ‘beer’ in the recipe and as such got a swift clicking. I know what you’re thinking; steak and ale pie, maybe beer battered fish, right? Wrong. This was a recipe for “Chargrilled steak with beer, mustard and watercress salad”. I was more than a little intrigued by the use of beer in a salad dressing, and lots of questions instantly popped into my head. Wouldn’t it fizz up too much? How would it mix with the oil and mustard? What type of beer would it be? Maybe something like Summer Lightning that is light but has a peppery hop edge to go with the Watercress? Well first of all, I’ve got a bone to pick with you BBC Food. Sort the grammar out on the recipe title. The recipe isn’t for "Chargrilled steak with beer, mustard and watercress salad" it’s for “Chargrilled steak with beer mustard and watercress salad”, that pesky comma implies it’s a watercress salad with a beer and mustard dressing, not a steak served with some beer mustard and a watercress salad. Have they not read Eats shoots and leaves? Now to my point (only took 200 words). Everything in the recipe is very specific; cider vinegar, yellow mustard seeds, ribeye steak, rapeseed oil etc. Until you get to ‘beer’, one of the title ingredients no less, and you just get a flat ‘110ml of Beer’. That’s it? Just, beer? I’ve seen this lack of detail before in recipes like the aforementioned steak and ale pie, but at least they usually say something like ‘one bottle of ale’ which I usually take to mean 500ml of something like Speckled Hen or London Pride, an everyday, readily available, perfectly decent English ‘Ale’. I can forgive the use of ‘Ale’ in this instance because I can infer enough from that word to know what type of beer the recipe is requesting. But to just use the word ‘beer’, and give no explanation as to which of the thousands of types, styles and flavours are needed left me a bit confused. Now put beer geekery aside for a moment - Even if we strip it back to the most basic of style definitions, one which everybody in the country would identify with, i.e. ‘Lager or Bitter’, ‘Beer’ is still a confusing choice of words. It’s a bugbear of mine that chefs are notoriously bad at appreciating the diversity of beer (which you can read about in my other post about ‘Why don’t good restaurants offer decent beer’) but I think this one comes down to a case of what the majority classes as ‘beer’. 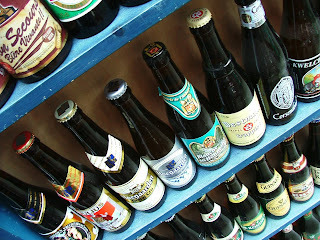 I think most people reading this blog would consider ‘beer’ as an all-encompassing term to define various styles. So, lager is beer, IPA is beer, Bock is beer, English Bitter is beer, Mild is beer, Amber Ale is beer, I think you get the picture. However I think that the confusion around the term, and possibly the reason the BBC chose to define the ingredient simply as ‘beer’, stems from the fact that a lot of normal* people think of two types of drink available from taps in the pub – ‘lager’ and ‘beer’. I’ve had said to me a few times something along the lines of “You’re a beer drinker not a lager drinker aren’t you?” and what is of course being implied is that I’m a “Bitter drinker” who likes beer from the old man handpulls. I nearly always let it go and say 'yes', despite the voice in my head shouting ‘imbeciles!’. It’s a muddled and backwards way to define things because if Beer=Bitter then why do people still say “Fancy going for a beer?” when actually they mean lager? My interpretation of the recipe I mentioned was that it required an English Bitter type beer such as the aforementioned Speckled Hen or London Pride, but for me the fact I could decipher it isn’t the point. It’s the UK beer industries job (and us as the commentators) to demystify the more complicated terms, explain that beer can mean anything from a lager to a porter, identify the differences and promote the diversity of flavours and styles. Chefs and food writers aren’t blame free either; they’re doing a half-arsed job if they think ‘beer’ is a good enough descriptor of an ingredient. It promotes the view of beer as one dimensional, interchangeable, boring. What if I’d substituted braising steak for the ribeye? I assume that wouldn’t matter? Or French’s Hot Dog mustard instead of English? Next time just list the ingredients as “Beef, beer, mustard, salad, oil” and have done with it. Either that, or do your job properly, you’re meant to be the experts. p.s. In case your wondering, “A pint of non-descript” is from a comedy sketch taking the piss out of Corrie/Eastenders which I vividly remember. Unfortunately Google is saying NO to its existence at present, meaning I’m either mental, or Google has failed. I'll let you decide which is more likely. Good post, there are restaurants that do good beer in London but as for beer and food matching, that still needs a lot of work doing. There is still educating or chefs and managers to be done on a large scale and it's our jobs as 'commentators' as you say to help the education process. There is still a stigma about doing beer and food matching in restaurants. One example close to me is Brew Wharf, a brew pub, with a beer matched menu and staff that don't seem to get it! it's infuriating at times! They do it a little bit in some pubs around here but like you say it tends to be on the menu rather than coming from the staff. Appreciate you reading the full post aswell, it's longer than usual but i think it's an important issue. Beer is just as 'gourmet' as wine and when used like the above it should at least be treated as a specific and important ingredient. i'm not saying they shouldbe put '100ml of brewdog 5am saint' but they couldve said '100ml of amber ale' or something easy to understand. interesting — was looking through a 1990s cookbook today, Chefs, and Rowley Leigh’s recipe for skate in beer called for a ‘Belgian wheat beer’; meanwhile in Elizabeth Luard’s seminal European Peasant Cooking from the 1980s she calls lambic a “lager’. At least they tried. so it seems we're actually moving backwards!